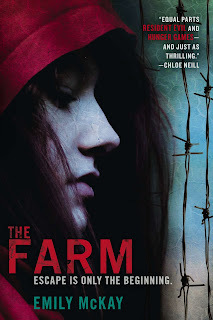 Emily McKay, author of The Farm, is stopping by today as part of her blog tour and answering questions about her newest novel, which releases tomorrow. This book is fast-paced, engaging and, in a word, fantastic. It's vampires the way vampires should be, so be sure to get yourself a copy ASAP and settle in because you'll want to finish it in one sitting. What was the first image that sparked the story that would later become The Farm? I was sitting in a workshop about world building at a writer's conference and I was thinking about this basic inconsistency in all vampire stories. If they're really stronger, faster, smarter than us, then why are they the ones who are hiding? Why not just take over and farm us as food? Of course, it took me a couple of years to get from that spark of an idea to an actual story that made sense, but that was thespark. How did you make the switch from writing romance novels to post-apocalyptic vampire novels? Don't laugh, but I think there's actually a common thread between romance novels and a lot of post-apocalyptic fiction. Obviously, I've always loved reading and writing romance novels. Romance novels are the most optimistic of all fiction and also the most intimate. But I've also always been drawn to post-apocalyptic stories. The Postman by David Brin is one of my all-time favorite books. There's a sort of basic optimism in many post-apocalyptic books (not all, but a lot). They're stories of humanity sinking to the absolute depths, but rising out of those depths to carry on. There's a powerful message of love and hope in the very idea that there will be a post apocalypse, that there will be anything after. Of course, to me the most interesting aspect of the apocalypse is how we take care of the people we love as things are falling apart. What kind of sacrifices we're willing to make to for others. I had known for years that someday I wanted to tell a post-apocalyptic story, I just needed to find the right setting. And then, of course, I added in lots of scary monsters, dramatic sacrifices and a hot guy. :-) With The Farm, I got to play around in all the sandboxes I love best. Mel's chapters have a distinct rhythm and add another dimension to the story. What compelled you to give her a POV? From a plotting perspective, when I started writing the book, I decided early on that Lily needed someone to take care of. The stakes wouldn't be very high if Lily was only trying to get herself off the farm. Lily needed someone who appeared vulnerable and defenseless, but at the same time, wasn't. Mel has her own quiet strength and her own amazing intelligence. She brings a lot to the table. For the reader to see all that, we needed to be in her head. The first several drafts of the opening chapters didn't have Mel's point of view. I still remember the buzz of excitement I felt when I first considered writing in her POV. It was terrifying and exciting all at the same time. Was there a bit of research or a scene you love that didn't make it into the final book? I also did some research on Aztec culture and origin myths that may come up in later books. As a writer, there are always things I need to know about the world that the reader just doesn't need to. Maybe some of it will come up later, maybe not. Book two is already highly anticipated. Can you give readers a taste of what's to come? Emily McKay loves to read, shop, and geek out about movies. When she’s not writing, she reads on-line gossip and bakes luscious deserts. She pretends that her weekly yoga practice balances out both of those things. She lives in central Texas with her family and her crazy pets. Though she’s never been much of a joiner, she somehow still managed to join multiple group blogs. (A pathological need to be part of any group of that wants her? Best not to analyze this too deeply.) So you can visit her at the Jaunty Quills, Harlequin Desire Authors, or Peanutbutter on the Keyboard. She also co-write young adult rom-coms as Ivy Adams. Thanks so much for having me! I'm thrilled to be here! SandyG265, yes, part of what drew me to the story was I wanted Vampires that were scary! Not that I didn't love Twilight, but I wanted more blood sucking monsters! It's a pleasure having you pop in! I thoroughly enjoyed The Farm and will be posting a review soon. I need to know what happens next! Fall 2013 is too far away! Well, if you want to spend more time in that world, I just put up a website for the National Disease Pandemic Control Organization (NPDCO.org) where there’s info about the spread of the Tick virus and the Farm facilities. Starting in January, there will be a fun Twitter campaign that describes the spread of the Tick virus. (You can follow that at: @EscapeTheFarm https://twitter.com/EscapeTheFarm) Also in January I’m putting out an e-novella prequel that’s Lily and Mel’s story. So basically, there’s lots of fun things out there for people interested in how we get from where we are now to the beginning of The Farm. thanks for the giveaway! This is at the top of my to-read list- I love the concept! Thanks, Kirsten! I hope it lives up to your expectations! I have so excited to read this book, so thank you for hosting such a fantastic giveaway! Thanks, Amanda! Be sure to enter at the other stops on the blog tour! Thanks for the chance to win! I can't wait to read The Farm!! Thanks, Natasha! I hope you enjoy it! I am SO excited that the sequel is already in the works. And novellas? Awesome!! Thanks! Yes, just keep up with me on Twitter or Facebook and you'll know right when the novellas go up. Thank you so much for the giveaway! Sounds like this is going to be a good one. Thanks, Victoria, I hope you enjoy it! I have been waiting MONTHS to get my hands on this book, it looks freakin' AMAZING! Thanks, Tiffany! I hope you enjoy it! This book is on my xmas wishlist! It looks fascinating and I can't wait to check it out! Thanks for the great giveaway! The Farm is on my very long to-read list. It looks so interesting! Thanks for the chance to win. That's a great inspiration! I've wondered the same thing about vampires and I'm excited to see a story that tackles that inconsistency. I've seen this book at my local bookstore, I'll totally read it now!